Whitecliff is an award-winning winery and vineyard owned by Michael Migliore and Yancey Stanforth-Migliore and has one of the largest vineyards in the Hudson Valley. Its 32 acres are primarily in Gardiner, with six additional acres now established across the Hudson River, in Hudson. Focused on Cabernet Franc, Gamay Noir, Pinot Noir, Chardonnay, and Seyval Blanc, their vineyards serve as the foundation for a 6,500-case annual wine production. Among other things, Whitecliff is a member of the Hudson Valley Cabernet Franc Coalition, which is meant to showcase the variety as the Valley’s signature grape. 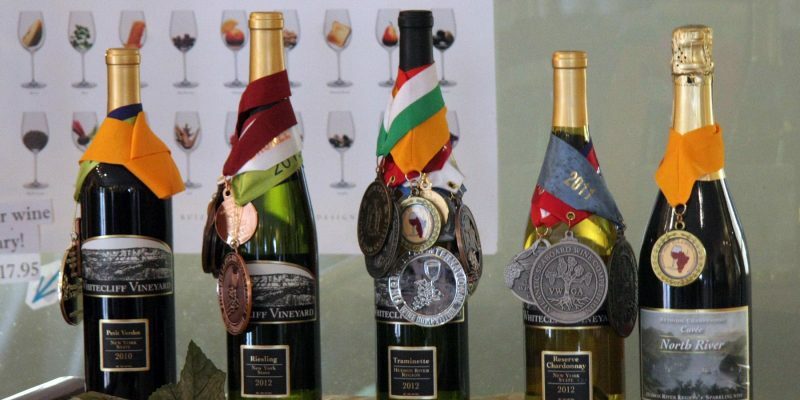 In 2018, Whitecliff was awarded a coveted Double Gold Medal from the prestigious San Francisco International Wine Competition (SFIWC) for its 2016 Cabernet Franc. This makes 2018 a great year for Whitecliff. It marks the beginning of its twentieth year in business, and it began with yet another international Double Gold; for Whitecliff’s Gamay Noir at the Finger Lakes International Wine Competition. With two international awards for Hudson Valley reds this year, Whitecliff is chipping away at the outdated assumption that New York doesn’t produce great red wines. Furthermore, it confirms the idea that Cabernet Franc is indeed the red variety of the Hudson Valley. To really enjoy the wine, it should be decanted or poured into glasses for about an hour before drinking it, so that the exposure to air will soften the high acidity typical of such young wines. Already it offers aromas of dark red fruit, delicate herbal notes, and a hint of oak. It has good body and the flavors confirm what the nose tells you. While enjoyable now, I think that it would benefit from being laid down for a few years. Buy a case and open a bottle every few months. You’ll find that it will evolve over time. It really is good, and will get even better. But then, a Double Gold-winning Cabernet Franc should do exactly that! 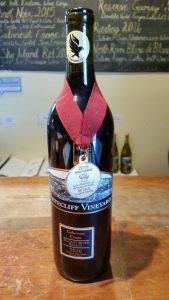 This high level of achievement for Whitecliff’s Cabernet Franc, which was made from estate-grown grapes at their home vineyard at 331 Mckinstry Road in Gardiner, will no doubt contribute to recognition of the Valley as a significant producer of this variety. Call (845) 255-4613 for more information.